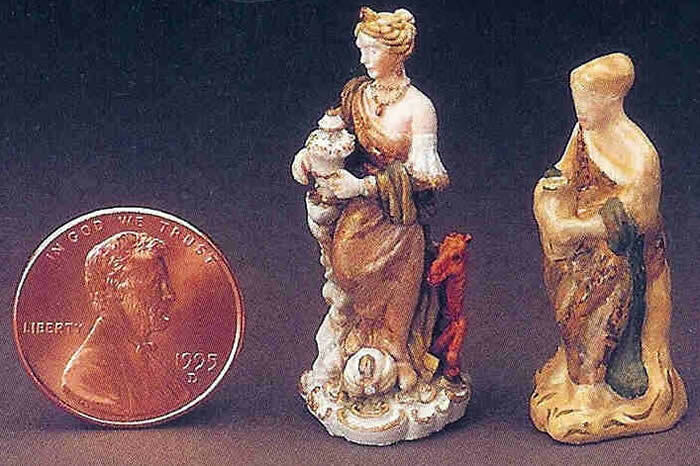 Description: Lady with an Urn is a revisit ot the first piece ever carved by Robert Olszewski in miniature, and is being offered in four different dress colors as it was originally released in 1977. Click here for information about the Pre-Goebel piece of Olszewski art. Only a total of 15 were ever made and they are the rarest of all Olszewski figurines. Only 250 of each color are being made of the 1995 version. "Lady with an Urn" was the third release for 1995. Orders for this piece were handled on a first come first serve basis because of the limited number and unique release. Shown here is the "Lady with an Urn - 1995" release depicted with a 1995 Lincoln Penny to show size of the beautifully detailed piece. Standing beside her in the photo is the rare first "Lady with an Urn" released in 1977. Olszewski said creating the 1995 version was like "visiting an old friend" after 20 years. This is a very exceptional "reaching back" move on Olszewski's part considering his just moving forward with reestablishing Olszewski Studios in 1994.